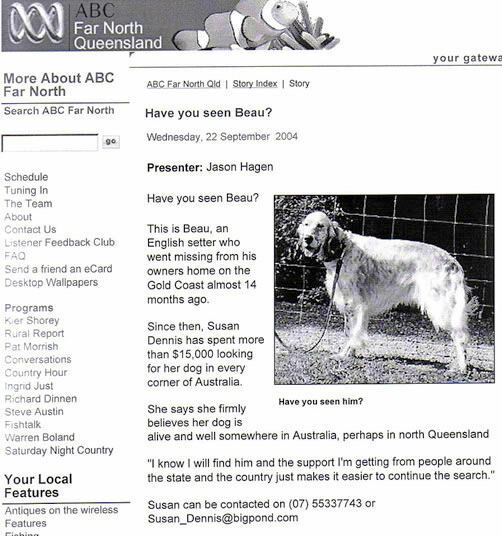 Despite the extensive media exposure throughout Australia and the extensive search I have undertaken throughout Australia to try to find Beau since 1 July 2003, there has still not been one sighting of Beau. There are many reasons for this (refer the The Legal Status of a Dog and the Stolen Dogs web pages). 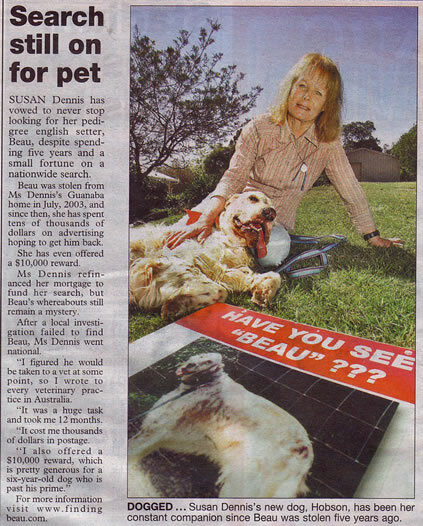 Please note I had to withdraw the $10,000 Reward on 16 February 2008 because of the continuing costs associated with my search for Beau. It is illegal for me to offer a Reward amount I am no longer able to pay. 89.3FM 4CRB covers the entire South East Queensland corner from south of the Brisbane River near Beenleigh, west to Beaudesert and south to Byron Bay in New South Wales. 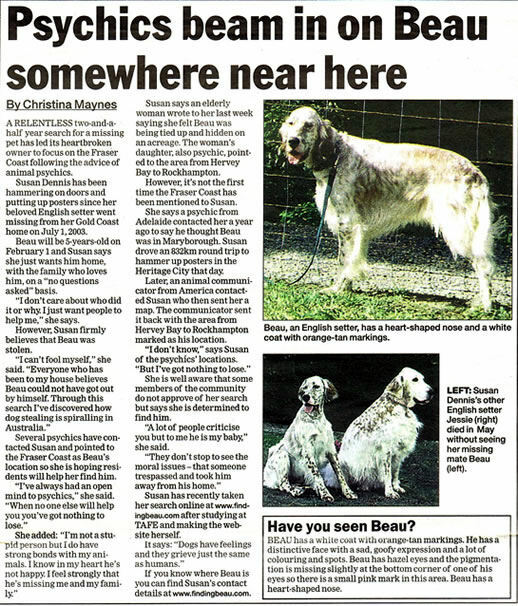 Milton and his team advertised Beau several times a week, several times a day non-stop for at least 6 months after Beau was stolen to help me find Beau. Regarding the wording of this advertisement, Beau was not sick and he did not require medication. I was advised to say this to prompt whoever had Beau to let him come home. I was also advised not to state a Reward amount and not to state that Beau had been stolen. 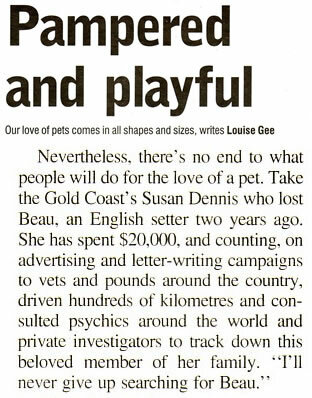 Wendy, the Manager of the Local Newsletter, City of the Gold Coast printed this story to help me find Beau not only in Division 2, which is the Division of the City of the Gold Coast in which we live, Wendy printed this story in every Division of the City of the Gold Coast. 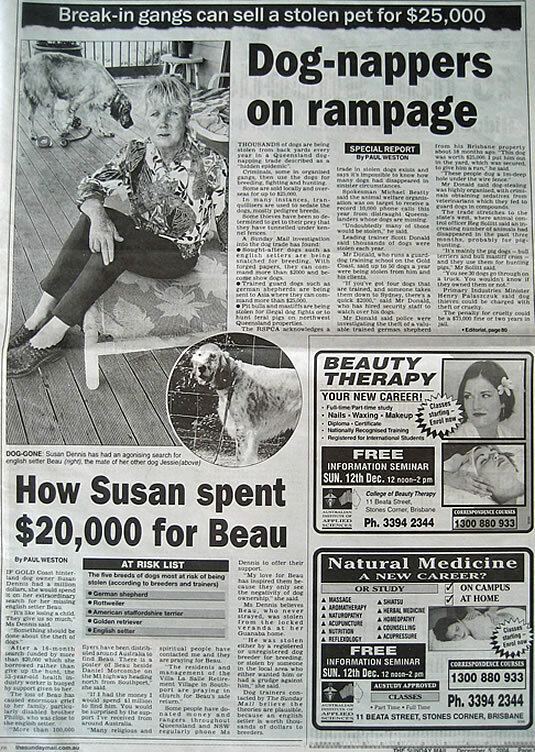 There are 15 Divisions in the City of the Gold Coast and in 2003 The Local Newsletter was delivered to every residence. The population at that time approximated 425,000. 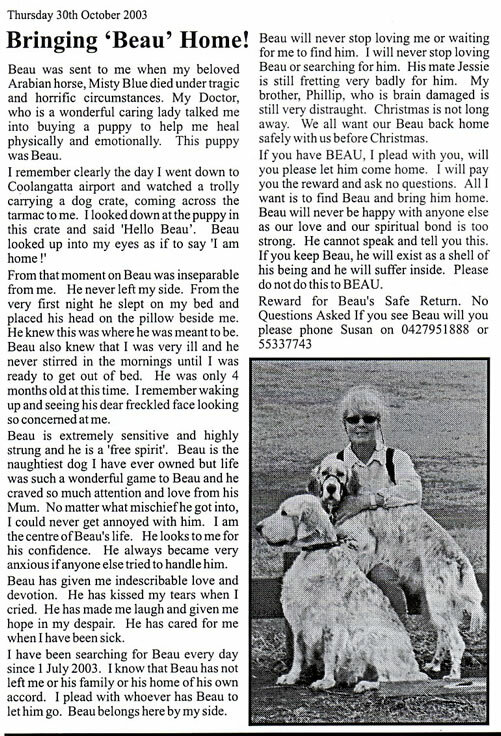 Wendy said "I am more than willing to put a story about Beau into all of our newsletters for you until you find him." This story was printed several times Free of Charge. 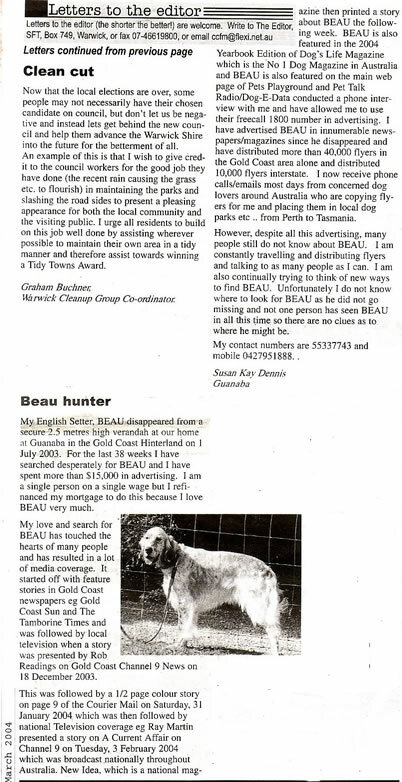 Unfortunately even with this major advertising coverage on the Gold Coast, Beau was not found. 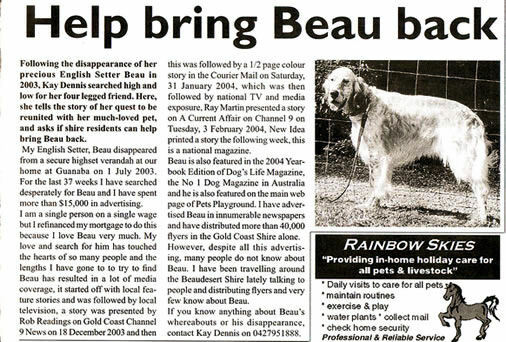 In addition I advertised weekly in several newspapers for more than 12 months after Beau was stolen and continued the newspaper advertising until December 2007. Whoever stole Beau had no intention of returning Beau to me despite the Reward and knowing how much Beau meant to me. These	criminals	did	not care about the trauma I suffered, the trauma Jessie suffered and the terrible impact on all members of my family. The puppyhood I planned for baby Hobson was ruined because how could our lives possibly be "normal" after Beau was stolen. 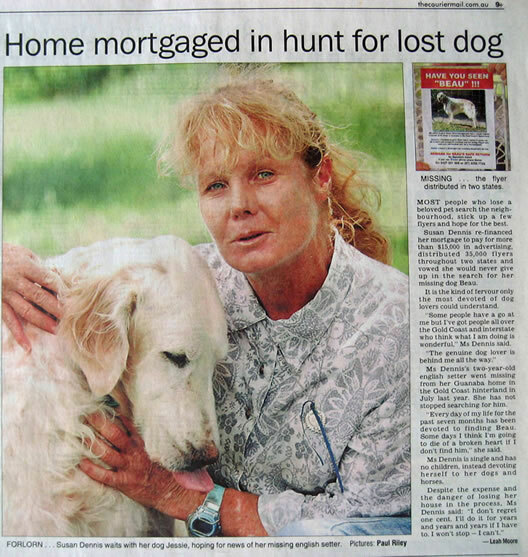 This story about my search for Beau was printed on page 9 of the Courier Mail on Saturday, 31 January 2003. Based on Roy Morgan Research the readership of the Courier Mail on a Saturday is approx. 800,000. Based on Roy Morgan Research, New Idea has a readership of in excess of 1.5 MILLION. Excluding my own advertising which was extensive, the media stories up to this time reached more than 5 MILLION. Despite this, not one person had seen Beau. 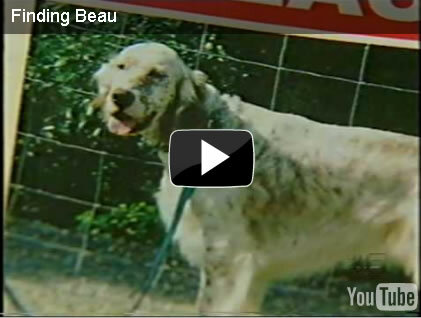 This was only the beginning of major media attention about my ongoing search for Beau. My story reached MILLIONS and MILLIONS of people throughout Australia. Despite this, I have never received one piece of valid information about Beau. 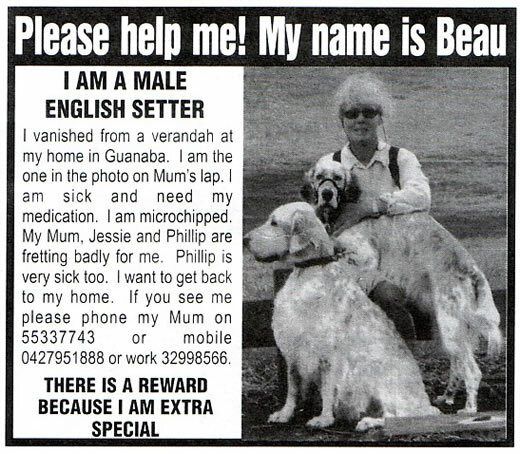 A major problem I continue to face trying to find Beau is that the average person does not know what an English Setter looks like, despite including a photo of Beau in all advertising. For some reason, even though the advertising states that Beau has a long white coat with orange/tan markings, people still think he has a red coat or a cream coat. The majority of the dogs sighted as Beau were Golden Retrievers, Labradors (a short-coated dog), Mareemas and Irish Wolfhounds (much larger dogs), Rhodesian Ridgeback X's (red and short-coated), Great Danes (much larger and short-coated) and a multitude of Cross-breeds as well as a Greyhound and a German Shepherd Dog. 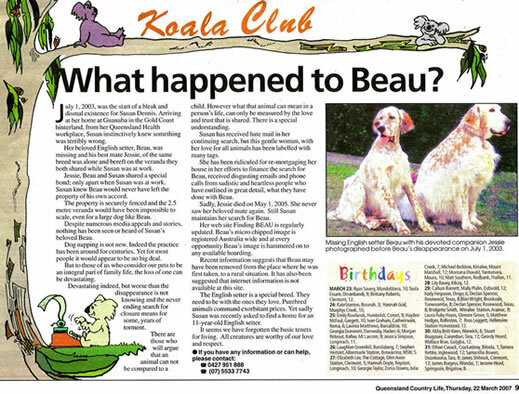 0n 3 March 2006 there were two (2) male English Setters with Orange Belton colouring, the same as Beau, shown on the Brisbane City Council Lost Dogs website. One dog was described as a Curly Coated Retriever and the other as a Golden Retriever. Even council dog pound staff do not recognise the English Setter breed. 17 September 2004 ... THE NORTHERN MINER ... FRONT PAGE !!! Daniel Bateman, the journalist who wrote this story emailed me: "I have received word of your search for Beau through Charters Towers City Council. While Charters Towers is a fair way from the Gold Coast, I would like to help assist your search with a story we can run to help give people a heads up if Beau is in North Queensland". 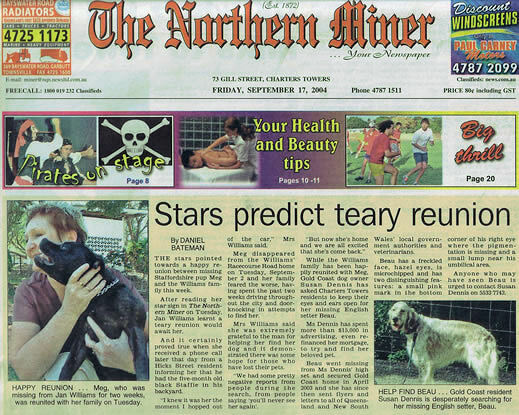 Following the front page story in The Northern Miner, I was initially contacted by Radio ABC in Townsville and then Radio ABC in Cairns who interviewed me and placed a photo of Beau on their websites. 5 December 2004 ... THE SUNDAY MAIL ... FRONT PAGE !!! Based on Roy Morgan Research, The Sunday Mail has a readership of in excess of 1.2 MILLION. 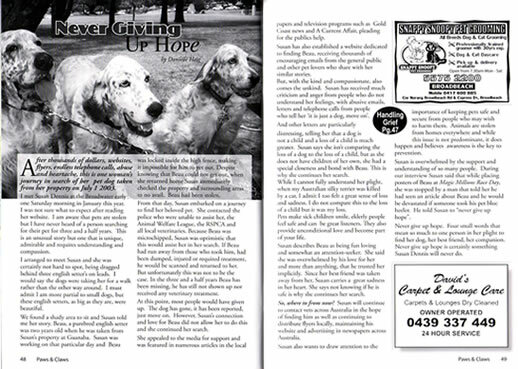 My beautiful English Setters, Jessie and Hobson are shown in this video. Jessie avoided the media attention. Hobson could not do this because he needed to be with me. 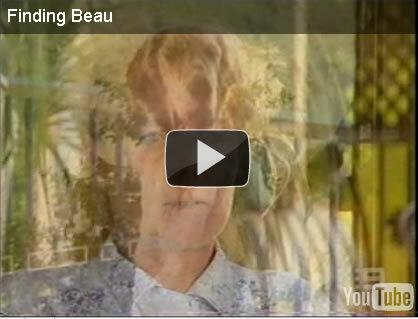 I was going through some very tough times trying to cope with many major problems as well as trying to find Beau. Hobson was always an extraordinary dog, like Jessie. You will notice I smile when I have my arm around Hobson. My horses, Khomet and Bonnie also meant the world to me. They all mattered to me, as well as Beau. I always receive a backlash from some humans when the media mentions an amount of money I have spent searching for Beau. 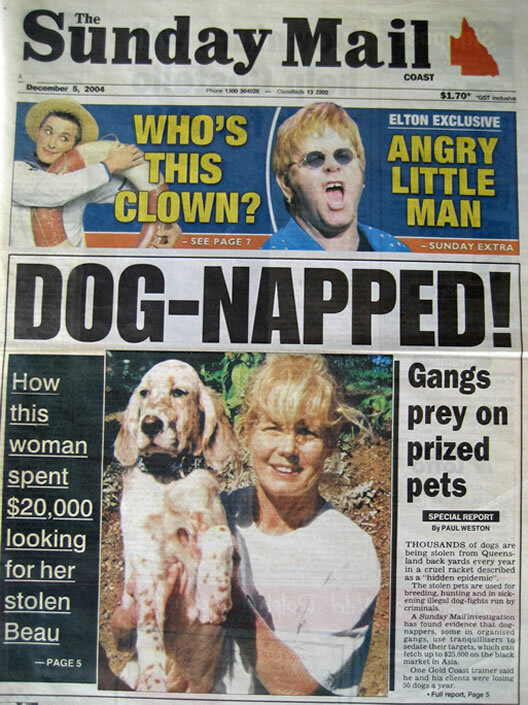 Many responsible dog owners thanked me for this story because it made them more aware of dog stealing. They are now taking greater precautions to protect their beloved 4-legged family member. They possess an understanding of how I feel about Beau. Some humans ignore that a criminal has trespassed into the sanctity of our home and stolen a very loved member of our family, our English Setter "Beau". Some humans ignore that stealing a dog is a criminal offence. Some humans ignore that stealing a dog is a serious form of animal abuse which is directly related to child abuse. I admit I respect all life. I do not consider that the human species is superior to all other life forms on earth. I believe that if innocent animals are not protected, because animals are the first to suffer, this will lead to increased cruelty towards children and innocent humans in our society. Elisabeth Kubler-Ross, Bestselling author of On Death and Dying, in her book The Wheel of Life .. A Memoir of Living and Dying believes that "The greatest gift God has granted us is free will. It places responsibility for making the highest possible choices on our shoulders". I love Beau. What harm am I doing to anyone by loving my dog, Beau??? What harm am I doing to anyone by continuing to search for Beau??? Why do people keep ripping down Beau's posters and flyers ? What harm are they doing??? Beau is not 'just a dog' to me. Eckhart Tolle, author of The Power of Now, Stillness Speaks and A New Earth believes that "Prejudice of any kind implies that you are identified with the thinking mind. It means you don't see the other human being anymore, but only your own concept of that human being. To reduce the aliveness of another human being to a concept is already a form of violence". The majority of the criticism directed towards me because supposedly I've made too big a fuss about a dog called Beau has come from dog owners. Is it any wonder I am having so much difficulty trying to find Beau??? 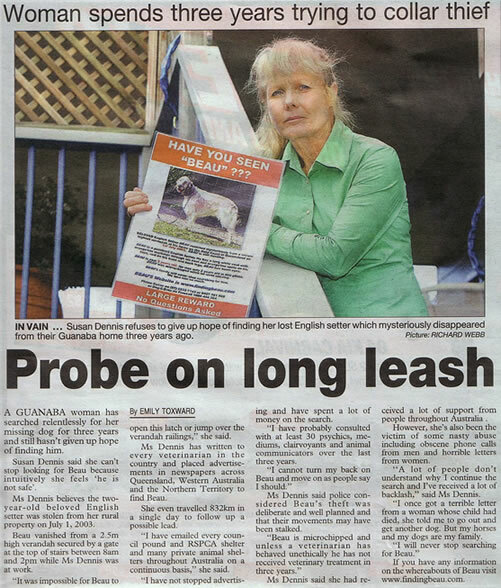 Is it any wonder so many other responsible dog owners are having so much trouble trying to find their stolen animals??? 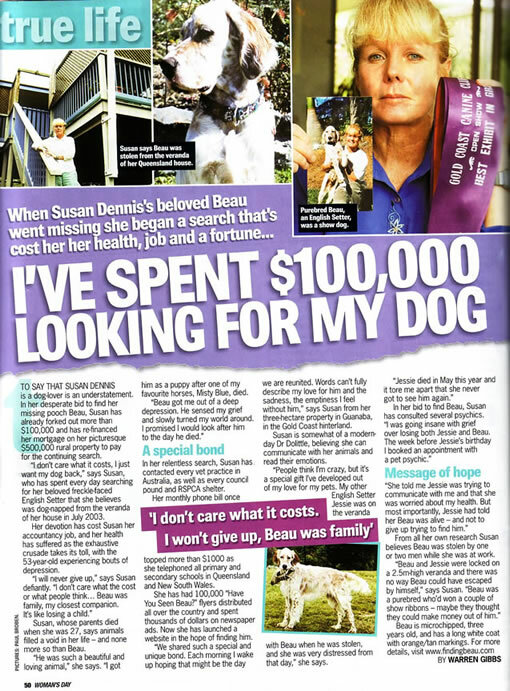 Unfortunately Womans Day sensationalised this story by stating that I had spent $100,000 searching for Beau knowing that this was untrue. I did not discuss my employment or my health with the Womans Day journalist. 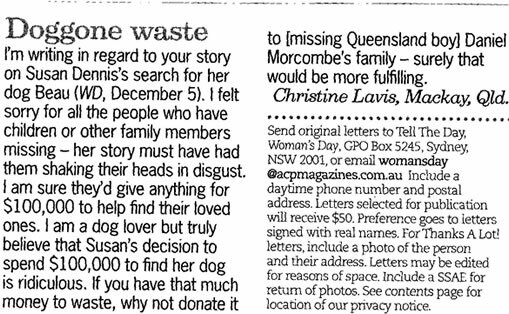 Following my complaint a retraction was printed by Womans Day on 27 February 2006. I was plagued with nuisance and obscene phone calls day and night following this story. Ms Lavis knows nothing about me. Yet she describes my behaviour as "disgusting". On the other hand Ms Lavis describes herself as a "dog lover". 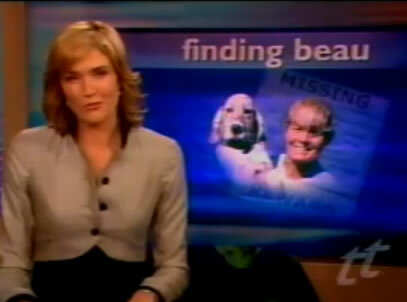 Ms Lavis compared my search for Beau with the missing Queensland boy, Daniel Morcombe. This upset me a great deal. This letter was printed the week before Christmas. My disabled brother, Phillip is too traumatised to come home any more because of what has happened to Beau. Our parents died when we were both young and our only family are our companion animals. Beau is not 'just a dog' to Phillip either. 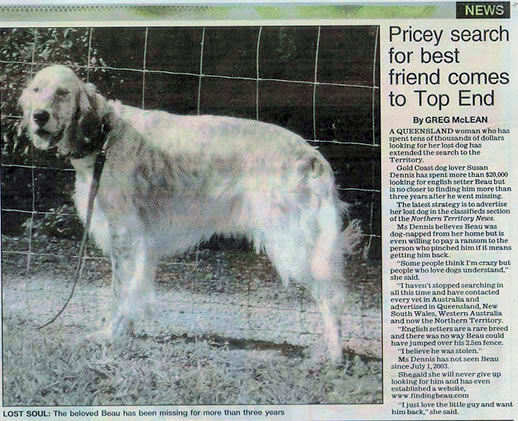 Our beloved English Setter, Jessie died on 1 May 2005 without ever seeing Beau again. The life of my young English Setter Hobson has been threatened. Hobson is grieving for Jessie. A little butcher bird whose life I saved who I called "little one" and who was a dear friend of mine for 5 years was hit by a car and killed on 26 October 2005. Our beloved horse, Bonnie was dying at the time, and she died the next day, 20 December 2005. My Arabian Horse, Khomet is grieving for Bonnie. I still cannot find Beau. I am also grieving for Jessie, "little one" and Bonnie. I am worried about all my family members. How do you think I was feeling about Christmas coming up! I am a single mature aged woman and I have worked extremely hard all my life to financially support human family members as well as provide appropriate care to my companion animals. I had to borrow the money to spend on my search for Beau as well as pay for veterinary expenses for my companion animals. To enable me to do this I have lived on the poverty line myself. If Ms Lavis had bothered to read my website she would have known that I did not spend $100,000 on my search for Beau. Yet, she describes me as "disgusting". With attitudes of "dog lovers" like this, is it any wonder I am having so much difficulty trying to find my stolen dog, Beau !! 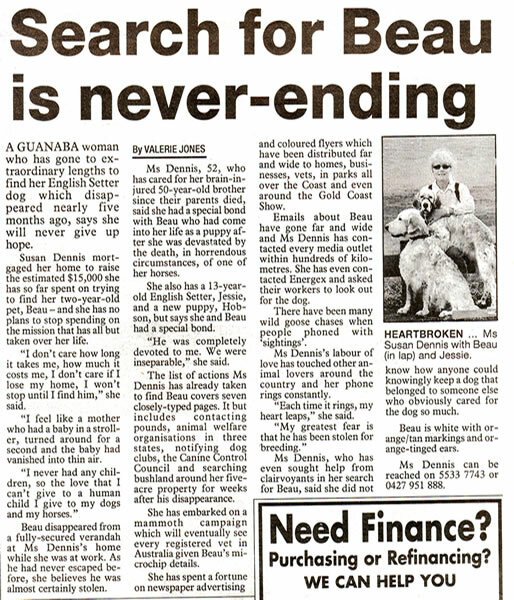 Despite the unfounded and undeserved criticism and abuse I receive, I focus my energy in a positive way by continuing to search for Beau in the hope that not only will I find Beau, my stand for Beau might eventually prompt "animal welfare organisations" to put a system into place to at least discourage the stealing of dogs. Stealing a dog is a crime. Stealing a dog is a serious form of animal abuse. There is a proven link between animal abuse and child abuse. 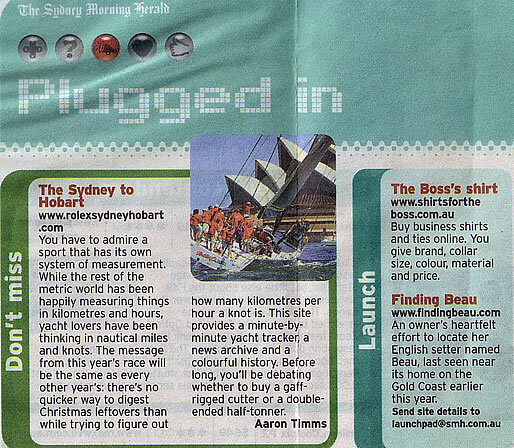 Based on Roy Morgan Research, the Herald Sun has a daily readership of in excess of 1.3 million. 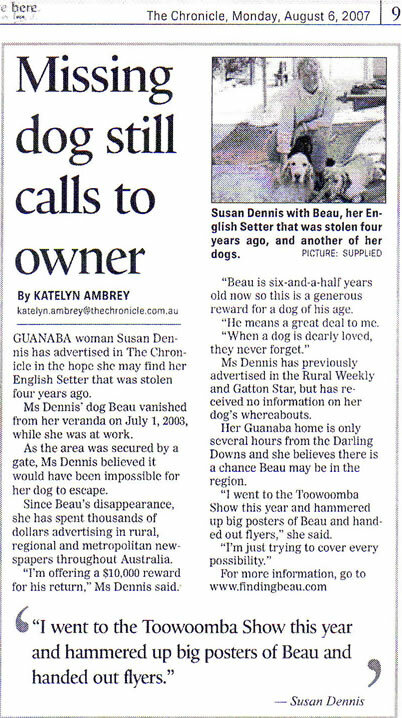 I received many phone calls from media organisations following this story about my ongoing search for Beau. Unfortunately I did not receive one valid piece of information about what had happened to Beau. 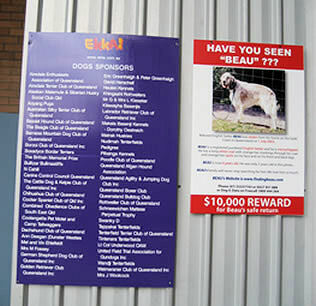 The Canine Control Council (Queensland) approved the display of Beau's poster at the entrance of the Dog Pavilion at the Royal National Dog Show at the "Ekka" to provide maximum exposure to help me in my search for Beau. 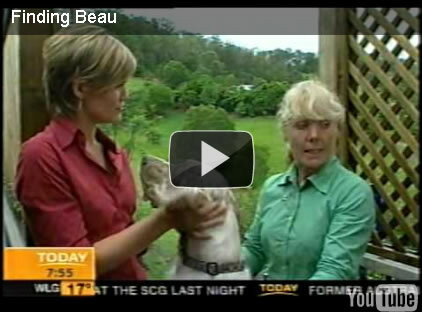 Channel 10 News in Queensland brought attention to Beau's poster in their News segment on the "Ekka". 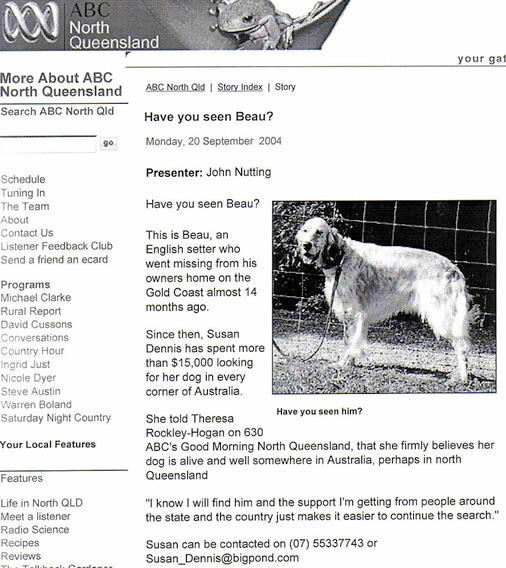 Because of the extent of my advertising, my search for Beau had reached dog breeding organisations in every State of Australia within a couple of months after Beau was stolen on 1 July 2003. I was still advertising more than 5 years later. I was extremely upset with this story printed by the Gold Coast Sun because it was not a reflection of the interview which was carried out in writing via email. Only 1 of the 5 questions asked by the journalist was reported correctly in this story and 3 of the 5 questions were omitted from the story. Despite my request that a Reward amount not be mentioned in the story, I was ignored. 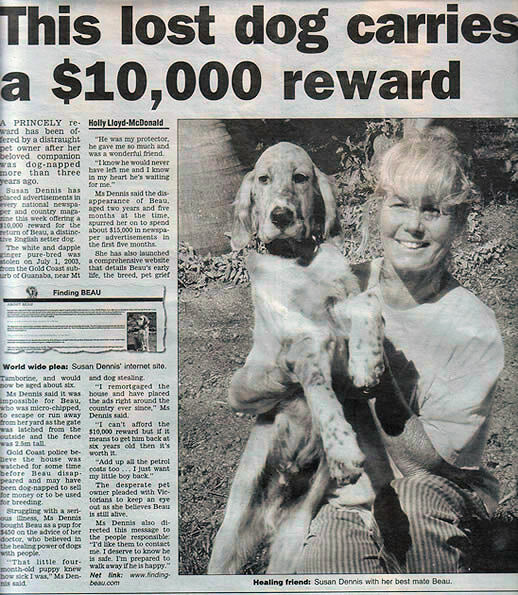 Even though the Gold Coast Sun knew I had withdrawn the $10,000 Reward on 16 February 2008, this Reward amount was mentioned TWICE. The Gold Coast Sun is aware of legal requirements regarding the advertising and printing of Reward amounts. I did not make any of the quoted statements in this story! I was deceived by the Gold Coast Sun. If I had known that the story was going to be fabricated, I would never have agreed to the interview. 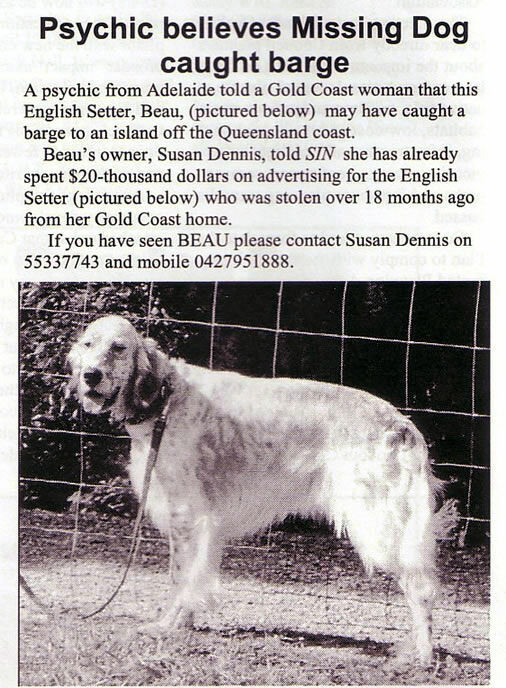 It was a waste of my time and did nothing to help me find my stolen English Setter, Beau. I was later advised that the Gold Coast Sun staff member responsible for this story had been sacked and the following clarification was then printed. "Love and compassion are necessities, not luxuries. Without them, humanity cannot survive. " ~ Dalai Lama.